The S’mores Frappuccino is a delicious, drinkable twist on a s’more that is proving to be a very popular menu item at Starbucks this summer. 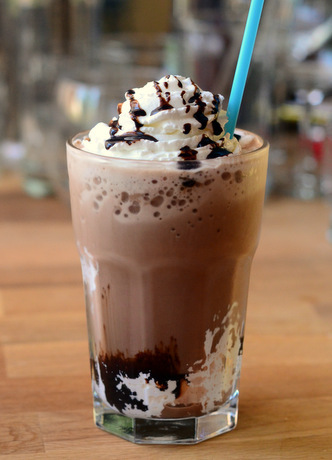 The drink is made with a coffee frappuccino base that is infused with a graham cracker syrup and is then layered with marshmallow-infused whipped cream and chocolate syrup in the cold cup it is served in. The drink captures the nutty flavor of the graham cracker and the fluffiness of a marshmallow in each sip and it is surprisingly delicious. I tried to capture all those same elements in my Homemade S’mores Frappuccino, which you can make at home without running to your nearest Starbucks store on a hot day. I used a mocha base that is slightly less chocolaty than some variations I make because I also added whole graham crackers to the mix. The graham crackers blend up completely, leaving the base with a toasty graham cracker flavor and just a hint of texture. Graham cracker syrup isn’t exactly a common ingredient and using whole crackers is just as effective at introducing the flavor. I layered my frappuccino with whipped cream and chocolate sauce, but added a spoonful of marshmallow fluff to the top of the drink before adding the final layer of whipped cream. The marshmallow fluff becomes too hard when added to the bottom of the cup, but it actually softens enough to slurp through a straw as it sits out on top, ensuring you taste all those s’mores flavors in each sip. In a blender, combine coffee, milk, cocoa powder, sugar, graham crackers and ice. Add slightly more ice for a thicker drink. Blend at low speed until ice is crushed, then turn up blender speed to high until drink is smooth and creamy, about 30-40 seconds. In the glass in intend to serve your drink in, place a layer of whipped cream followed by a generous spoonful of chocolate syrup/chocolate fudge. Pour on the frappuccino mixture, then top with a spoonful of marshmallow fluff, more whipped cream and a drizzle of chocolate syrup.